Also increases font weight of the "real slogan". Changes mouse hover to an "x"
- **🔀 You can use & modify everything as long as you credit [Digital Monopolies](https://monopolies.net) and use the same license for your resulting work. ** [Code license is AGPLv3](https://www.gnu.org/licenses/agpl-3.0.en.html) and content is [Creative Commons Attribution-ShareAlike](https://creativecommons.org/licenses/by-sa/4.0/). - Kashmir Hill, ["I Cut the 'Big Five' Tech Giants From My Life. It Was Hell. "](https://gizmodo.com/i-cut-the-big-five-tech-giants-from-my-life-it-was-hel-1831304194) Gizmodo, 7 February 2019. - Natasha Lomas, ["German antitrust office limits Facebook’s data gathering. "](https://techcrunch.com/2019/02/07/german-antitrust-office-limits-facebooks-data-gathering/) TechCrunch, 7 February 2019. - Mike Isaac, ["Zuckerberg Plans to Integrate WhatsApp, Instagram and Facebook Messenger. "](https://www.nytimes.com/2019/01/25/technology/facebook-instagram-whatsapp-messenger.html) New York Times, 25 January 2019. - Shoshana Zuboff, ["The Age of Surveillance Capitalism: The Fight for a Human Future at the New Frontier of Power. "](https://www.shoshanazuboff.com/new/) PublicAffairs, 15 January 2019. - Nick Routley, ["The 20 Internet Giants That Rule the Web (1998-Today). 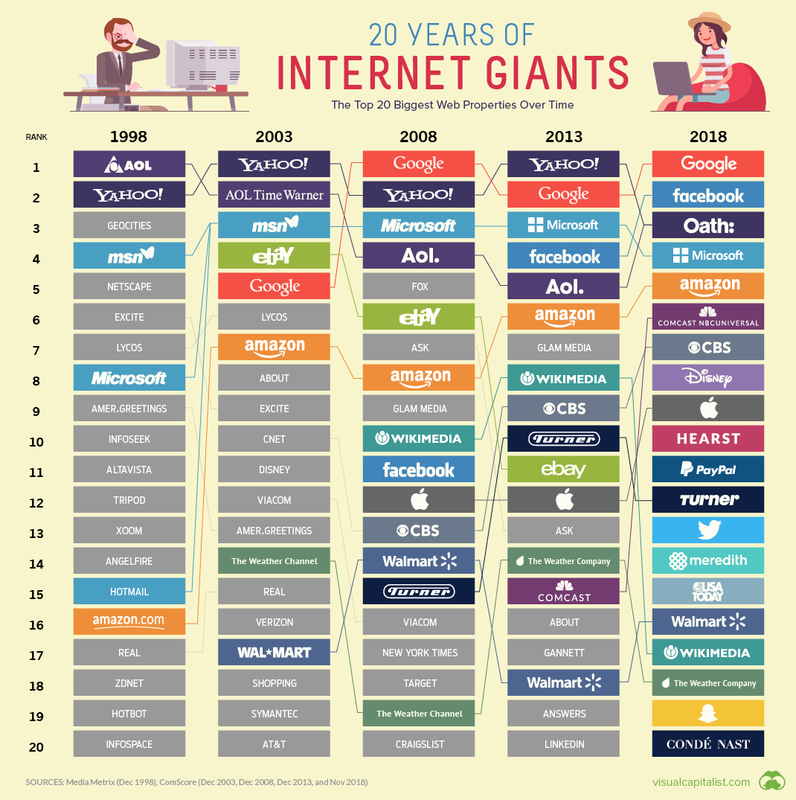 "](https://www.visualcapitalist.com/20-internet-giants-rule-web/) Visual Capitalist, 5 January 2019. - Paris Martineau & Louise Matsakis, ["Why It's Hard to Escape Amazon's Long Reach. "](https://www.wired.com/story/why-hard-escape-amazons-long-reach/) Wired, 23 December 2018. - Daniel Oberhaus, ["How I Quit Apple, Microsoft, Google, Facebook, and Amazon. "](https://motherboard.vice.com/en_us/article/ev3qw7/how-to-quit-apple-microsoft-google-facebook-amazon) Vice Motherboard, 13 December 2018. - Jennifer Valentino-DeVries, Natasha Singer, Michael H. Keller & Aaron Krolik, ["Your Apps Know Where You Were Last Night, and They’re Not Keeping It Secret. "](https://www.nytimes.com/interactive/2018/12/10/business/location-data-privacy-apps.html) New York Times, 10 December 2018. - Martin Herzog & Marko Rösseler, ["Allmacht Amazon." (German)](https://www1.wdr.de/fernsehen/die-story/sendungen/allmacht-amazon-100.html) WDR, 5 December 2018. - Christina Farr, ["I quit Instagram and Facebook and it made me a lot happier — and that's a big problem for social media companies. "](https://www.cnbc.com/2018/12/01/social-media-detox-christina-farr-quits-instagram-facebook.html) CNBC, 1 December 2018. - ["Most Americans aren't aware that Facebook owns WhatsApp, or that Google owns Waze. "](https://spreadprivacy.com/facebook-whatsapp/) DuckDuckGo, 16 October 2018. - Nilay Patel, ["It’s time to break up Facebook. "](https://www.theverge.com/2018/9/4/17816572/tim-wu-facebook-regulation-interview-curse-of-bigness-antitrust) The Verge, 4 September 2018. - Erik Rood, ["Interconnectedness of companies through shared board members. "](https://www.interviewqs.com/blog/board_members) Data Interview Questions, July 2018. - Mitch Stoltz, Corynne McSherry, Cindy Cohn & Danny O'Brien, ["Competition, Civil Liberties, and the Internet Giants. "](https://www.eff.org/deeplinks/2018/06/competition-civil-liberties-and-internet-giants) Electronic Frontier Foundation, 27 June 2018. - Steve Kroft, ["How did Google get so big? "](https://www.cbsnews.com/news/how-did-google-get-so-big/) CBS News, 21 May 2018. - Robert Reich, ["The Monopolization of America: The Biggest Economic Problem You’re Hearing Almost Nothing About. "](http://robertreich.org/post/173655842990) Inequality Media, 6 May 2018. - Katharina Nocun, ["Die Daten, die ich rief – Wie wir unsere Freiheit an Großkonzerne verkaufen." (German)](https://www.luebbe.de/bastei-luebbe/buecher/politik-und-gesellschaft/die-daten-die-ich-rief/id_6549526) Bastei Lübbe, 27 April 2018. - ["Social media giants Facebook, Tencent, Google reign. "](https://internethealthreport.org/2018/social-media-giants-facebook-tencent-google-reign/) Mozilla Internet Health Report, April 2018. - Stacy Mitchell, ["Amazon Doesn’t Just Want to Dominate the Market—It Wants to Become the Market. "](https://www.thenation.com/article/amazon-doesnt-just-want-to-dominate-the-market-it-wants-to-become-the-market/) The Nation, 15 February 2018. - ["Corporate Consolidation. "](https://www.youtube.com/watch?v=00wQYmvfhn4) Last Week Tonight with John Oliver, 24 September 2017. - Nick Srnicek, ["We need to nationalise Google, Facebook and Amazon. Here’s why. "](https://www.theguardian.com/commentisfree/2017/aug/30/nationalise-google-facebook-amazon-data-monopoly-platform-public-interest) The Guardian, 30 August 2017. - Hannah Jane Parkinson, ["Wake up! Amazon, Google, Apple and Facebook are running our lives. "](https://www.theguardian.com/commentisfree/2017/may/12/wake-up-amazon-google-apple-facebook-run-our-lives) The Guardian, 12 May 2017. New York Times, 10 May 2017. - Jonathan Taplin, ["Move Fast and Break Things – How Facebook, Google, and Amazon Cornered Culture and Undermined Democracy. "](https://www.jontaplin.com/the-book) 18 April 2017. - Lina M. Khan, ["Amazon’s Antitrust Paradox. "](https://www.yalelawjournal.org/note/amazons-antitrust-paradox) Yale Law Journal, January 2017. - Chen Xinlei, ["China's digital monopolies are killing competition. "](https://www.businessinsider.com/chinas-digital-monopolies-are-killing-competition-2015-8) Business Insider, 18 August 2015. - Philip Bump, ["From Lycos to Ask Jeeves to Facebook: Tracking the 20 most popular web sites every year since 1996. "](https://www.washingtonpost.com/news/the-intersect/wp/2014/12/15/from-lycos-to-ask-jeeves-to-facebook-tracking-the-20-most-popular-web-sites-every-year-since-1996/) Washington Post, 15 December 2014. - ["Internet monopolies: Everybody wants to rule the world. "](https://www.economist.com/briefing/2014/11/27/everybody-wants-to-rule-the-world) The Economist, 27 November 2014. - Sam Schechner, ["Europe Targets U.S. Web Firms – French, German Officials Call for Greater Power to Regulate Internet Companies. "](https://www.wsj.com/articles/french-german-officials-call-for-fresh-look-at-internet-giants-1417110508) Wall Street Journal, 27 November 2014.
."](https://digitalcommons.law.umaryland.edu/fac_pubs/1343/) 20 George Mason Law Review 1009, 2013. - Paul Sawers, ["Facebook, Twitter, iTunes and Google: The rise of digital monopolies. "](https://thenextweb.com/insider/2011/10/02/facebook-twitter-itunes-and-google-the-rise-of-digital-monopolies/) The Next Web, 2 October 2011. - Albert Einstein, ["Why Socialism? "](https://monthlyreview.org/2009/05/01/why-socialism/) Monthly Review, May 1949.
enable-background="new 216.015 0.002 1009.087 244.23"
d="M165.676 453.168c1.496 1.372 7.404-.597 9.004.55 1.412 1.017-.022 6.552-.64 6.66C42 483.763 97.948 341.814 55.68 245.8a36.668 36.668 0 0 1-15.785 3.292C17.86 249.09 0 231.26 0 205.468c0-1.91.008-2.994.008-2.994.19-1.355.84-1.586 1.164-2.89A40.002 40.002 0 0 1 21.8 173.668c20.805-10.024 43.825-1.387 63.813 28.472 36.153 54.003 32.412 207.34 80.063 251.026zm518.693-259.42c.062.35.583-.36.583 1.535 0 22.14-11.873 42.91-37.81 42.91a33.966 33.966 0 0 1-12.168-2.282c-38.778 104.653 30.93 262.24-127.61 221.044-170.258-44.247-260.478-9.192-260.478-9.192s-1.944-4.2 0-6.004c1.92-1.78 8.875-2.984 11.52-4.726 25.17-16.575 82.407-30.65 155.603-28.63 94.703 3.4 149.238 45.477 163.646-46.82q.952-5.01 1.71-10.277c-19.17 29.87-57.794 40.46-74.036 11.742-3.95-6.976-7.012-15.972-9.137-26.183-9.9 21.097-26.83 44.926-52.46 43.496-16.264-.903-21.587-12.262-20.993-36.64.414-17.01 1.242-49.36 1.88-65.735 1.798-45.944-25.298-33.086-29.452-.988-1.662 12.86-2.95 82.078-.014 104.054-43.027 6.806-51.873-6.237-52.36-33.18-24.292 64.84-64.93 62.705-76.538 19.54-6.934 28.92-25.55 57.262-43.918 57.262-29.656 0-58.924-46.476-107.233-169.922a21.863 21.863 0 0 1 0-8.324c.1-.51 2.647 5.426 3.157 5.313 121.89-27.02 240.12-93.83 243.52-154.135a48.72 48.72 0 0 1-17.428 5.984c-26.708 3.753-51.495-15.4-55.145-42.12a68.076 68.076 0 0 1-.476-13.566c.09-1.004.55-.63.55-.63a48.84 48.84 0 0 1 41.187-40.89c26.132-3.53 51.19 17.797 59.23 52.828a104.273 104.273 0 0 1 2.23 16.04c0 63.062-48.55 144.48-205.96 206.862 28.846 51.324 48.874 89.355 65.176 82.808 9.397-3.777 11.762-21.7 9.338-90.215l48.543-27.648c-4.75 79.25 9.782 106.644 23.035 97.214 10.62-7.555 16.83-31.098 16.596-68.16-.578-29.742-2.75-46.11-2.75-46.11 31.078-30.647 46.055-27.94 46.25 10.688 23.79-81.16 82.586-62.898 79 10.87-3.578 73.728.363 87.88 6.688 87.88 8.58 0 20.44-15.45 19.562-31.606-1.574-40.992 4.188-88.55 28.71-109.448 34.298-29.22 62.9-2.055 73.583 14.106.443-1.172.93-2.313 1.4-3.465 23.285-52.43 53.197-51.13 70.86-37.122a37.784 37.784 0 0 1 12.41 21.84zm-92.247 46.72c-2.754-9.15-19.867-27.9-36.516-11.54-18.96 18.63-21.03 75.658-13.542 93.412 7.023 16.653 33.2 14.047 40.902-6.113 2.004-25.418 3.676-50.648 9.156-75.758z"
d="M174.68 453.72c.093.292-.022.546-.64.655C42 477.758 95.505 336.515 56.868 239.258a39.863 39.863 0 0 1-35.068-71.59c20.805-10.026 43.825-1.39 63.813 28.47 38.287 57.198 31.832 225.808 89.067 257.58zm510.273-259.336a37.72 37.72 0 0 1-50.638 35.528c-35.758 102.72 31.59 262.237-126.95 221.038-170.257-44.243-260.478-9.192-260.478-9.192 13.18-20.625 78.437-41.804 167.123-39.355 94.703 3.394 149.238 45.476 163.646-46.82q.953-5.01 1.71-10.282c-19.17 29.876-57.794 40.462-74.036 11.747-3.95-6.98-7.012-15.972-9.137-26.187-9.9 21.1-26.83 44.93-52.46 43.496-16.264-.902-21.586-12.258-20.993-36.64.414-17.005 1.242-49.356 1.88-65.73 1.798-45.945-25.298-33.087-29.452-.99-1.662 12.856-1.522 83.14-.73 104.05-43.026 6.806-50.274-5.272-51.217-35.096-24.292 64.836-65.355 64.62-76.964 21.46-6.934 28.92-25.55 57.258-43.918 57.258-29.656 0-58.924-48.793-107.233-172.242 122.997-26.542 243.247-94.56 246.678-155.385A48.81 48.81 0 1 1 330.47.38c26.132-3.53 51.19 17.797 59.23 52.832a110.52 110.52 0 0 1 2.23 22.04q.003 3.43-.205 6.86c-4.223 51.374-48.344 131.616-205.756 194.002 28.846 51.32 48.874 89.35 65.177 82.808 9.396-3.777 9.544-21.855 7.12-90.37a306.423 306.423 0 0 1 54.557-29.696c0 80.434 5.985 108.844 19.238 99.418 10.62-7.555 11.194-31.098 10.96-68.16-.577-29.746-1.866-46.52-1.866-46.52 31.076-30.647 52.25-30.143 52.448 8.486 23.79-81.16 83.296-60.286 79.71 13.483-3.58 73.727-1.793 87.875 4.532 87.875 8.58 0 15.832-15.45 14.953-31.602h.01c-1.574-40.992 8.786-88.553 33.31-109.452 34.296-29.218 62.898-2.05 73.58 14.11.443-1.172.93-2.317 1.4-3.47 23.285-52.43 53.197-51.128 70.86-37.12a37.698 37.698 0 0 1 12.993 28.48zm-92.83 38.21c-2.754-9.15-19.867-26.03-36.516-9.67-18.96 18.63-21.03 75.662-13.542 93.416 7.023 16.65 33.2 14.043 40.902-6.113 2.004-25.418 3.676-52.523 9.156-77.632z"
d="M494.762 300.387c-1.21-38.355 8.36-85.776 32.654-106.48 9.705-8.265 19.637-12.46 29.52-12.46 17.558 0 32.742 13.508 41.097 26.148l2.157 3.266 2.76-7.077c16.208-36.49 34.32-44.157 46.656-44.157 9.27 0 16.595 4.266 21.11 7.844a35.753 35.753 0 0 1-35.722 60.56l-1.904-.69-.666 1.91c-4.74 13.622-8.068 29.372-10.162 48.106-11.488 2.89-23.354 5.62-35.328 8.133 1.447-17.09 3.363-35.154 7.142-52.47l.11-.507-.15-.496c-2.206-7.336-11.88-17.95-23.602-17.95-5.752 0-11.21 2.5-16.227 7.43-15.285 15.02-19.094 51.29-17.978 73.242-13.513 2.112-27.443 4.007-41.468 5.647zm-305.446-14.222l-6.212-11.067 2.128-.844C361.272 204.486 386.89 116.524 389.73 81.99a109.02 109.02 0 0 0-1.978-28.332C380.66 22.758 359.906 2 336.107 2a40.032 40.032 0 0 0-5.347.36 46.82 46.82 0 0 0 6.736 93.145 47.718 47.718 0 0 0 6.578-.46A46.65 46.65 0 0 0 360.79 89.3l3.196-1.824-.207 3.676c-3.633 64.383-130.036 131.19-245.958 156.73 5.555 14.152 10.865 27.33 15.81 39.222 20.204 4.055 41.067 7.574 62.09 10.465q-3.127-5.548-6.406-11.405zM83.95 197.25c-13.827-20.655-29.497-31.573-45.317-31.573a36.557 36.557 0 0 0-15.924 3.774 37.862 37.862 0 0 0 33.306 68l1.925-.907.787 1.977a201.462 201.462 0 0 1 9.713 33c13.93 3.906 28.285 7.54 42.73 10.81-6.506-33.06-14.375-65.89-27.22-85.08zm226.876 44.602a310.346 310.346 0 0 0-50.52 27.723c.42 11.933.835 24.324 1.07 35.05 17.24 1.352 34.704 2.34 51.976 2.942-1.643-15.703-2.47-37.262-2.526-65.715zm81.133 65.938c.13-14 .448-31.06 1.226-37.05 2.226-17.204 11.234-30.685 20.507-30.685a9.277 9.277 0 0 1 6.766 3.043c4.58 4.766 6.712 14.78 6.155 28.965-.29 7.46-.648 18.996-1.066 34.305 14.497-.82 29.26-1.934 43.944-3.32-.027-13.102.555-31.49 1.82-57.583 1.15-23.628-4.316-43.604-14.992-54.815-5.383-5.65-11.742-8.633-18.394-8.633-17.262 0-33.114 18.926-42.407 50.625 0 0-1.102 1.847-2.393 1.605-1.29-.247-1.523-2.156-1.523-2.156-.067-12.928-2.633-28.342-14.49-28.342-8.362 0-20.073 7.128-33.897 20.628.273 3.93 1.308 20.12 1.806 45.726.084 13.277.092 27.102-.724 38.148q6 .06 12.028.063c11.59 0 23.57-.176 35.63-.523z"
d="M 186.38421,0.57812122 A 19.410791,19.42979 0 0 0 166.9729,20.008167 19.410791,19.42979 0 0 0 186.38421,39.438212 19.410791,19.42979 0 0 0 205.79552,20.008167 19.410791,19.42979 0 0 0 186.38421,0.57812122 Z M 357.63425,4.1411501 406.66951,175.62956 h 35.11826 l 24.74824,-81.572862 24.12963,81.572862 h 33.96889 L 575.23645,4.1411501 H 542.90744 L 508.23575,123.71956 472.86125,4.1411501 H 441.93786 L 452.24564,35.65794 425.53907,123.71956 389.69604,4.1411501 Z M 1.4843753,5.7307457 9.0102408,36.157629 V 174.50707 H 98.508016 C 132.50623,170.41042 144.73259,142.9062 143.70712,126.05145 142.7211,110.36716 139.7237,93.863759 125.48546,85.319336 133.61033,77.048016 137.47606,64.32997 136.72666,52.430213 136.45058,24.340039 112.98341,5.7307457 91.172479,5.7307457 Z M 38.795244,35.194458 h 47.644287 c 18.931739,0 20.352059,19.223648 20.352059,19.223648 -2.12981,19.223945 -16.567166,18.184429 -16.567166,18.184429 H 38.795244 Z M 807.8794,49.642071 c 0,0 -26.83722,-0.653808 -37.43898,18.354619 V 52.806783 H 738.96795 V 175.62956 h 31.47247 v -68.96109 c 0,0 6.29628,-22.940379 37.43898,-24.579029 z m 79.01793,0 c -35.40594,-8.16e-4 -64.10864,28.862409 -64.10895,64.467489 0.007,35.40483 28.40538,64.17885 63.61114,64.45298 23.14342,0.86201 50.73887,-11.58466 56.78074,-24.67681 l -24.45173,-13.71255 c -6.32525,8.08921 -18.74146,11.77534 -32.32901,11.7536 -15.17543,-0.0767 -28.02362,-10.48767 -32.80488,-24.96284 h 65.92454 c -0.002,0.007 -0.004,0.0167 -0.007,0.0255 h 30.12909 c 0.88269,-4.23639 1.33888,-8.55139 1.36167,-12.87973 -3.2e-4,-35.603644 -28.7008,-64.466257 -64.1053,-64.467481 z m -594.65686,0.604696 a 65.348863,63.843706 0 0 0 -65.34984,63.844673 65.348863,63.843706 0 0 0 65.34984,63.84467 65.348863,63.843706 0 0 0 65.34985,-63.84467 65.348863,63.843706 0 0 0 -65.34985,-63.844673 z m 662.19199,0.879892 v 2.882284 h 9.02663 V 77.37134 h 3.87275 V 54.008943 h 9.06692 v -2.882284 z m 26.50525,0 -2.06816,26.244681 h 3.65313 l 0.79064,-11.253923 c 0.26411,-3.932739 0.48301,-8.330759 0.57104,-11.601534 h 0.0915 c 0.83634,3.115027 2.02125,6.501117 3.42984,10.200224 l 4.79883,12.49954 h 2.90639 l 5.23808,-12.731281 c 1.4965,-3.621242 2.7285,-6.892389 3.7409,-9.968483 h 0.1317 c -0.044,3.270775 0.2193,7.669777 0.4393,11.329952 l 0.7504,11.525505 h 3.741 l -1.8485,-26.244681 h -4.8868 l -5.28189,12.695075 c -1.32053,3.309726 -2.37771,6.190955 -3.12599,8.838736 h -0.13177 c -0.74826,-2.725646 -1.76172,-5.606893 -2.9942,-8.838736 l -5.05877,-12.695075 z m -340.34043,1.680124 a 64.189483,61.411394 0 0 0 -64.18949,61.411397 64.189483,61.411394 0 0 0 64.18949,61.41138 64.189483,61.411394 0 0 0 34.20315,-9.52672 v 9.52672 h 29.98632 V 114.21818 52.806783 H 674.80043 V 62.27921 A 64.189483,61.411394 0 0 0 640.59728,52.806783 Z M 169.97444,53.480278 V 174.50707 h 31.23821 V 53.480278 Z M 886.56423,77.13235 c 15.98492,5.56e-4 29.43514,11.47109 33.61749,27.12095 h -67.23497 c 4.18232,-15.64986 17.63254,-27.120394 33.61748,-27.12095 z m -594.32376,2.556401 a 33.968887,33.834201 0 0 1 33.9689,33.834209 33.968887,33.834201 0 0 1 -33.9689,33.83419 33.968887,33.834201 0 0 1 -33.96888,-33.83419 33.968887,33.834201 0 0 1 33.96888,-33.834209 z m 347.65401,1.390447 a 33.968887,33.37072 0 0 1 33.96888,33.370712 33.968887,33.37072 0 0 1 -33.96888,33.37073 33.968887,33.37072 0 0 1 -33.96889,-33.37073 33.968887,33.37072 0 0 1 33.96889,-33.370712 z M 38.795244,102.06988 h 51.194912 c 11.595694,0 22.244674,9.93686 22.954634,22.812 0.70994,12.87516 -17.039362,19.5604 -17.039362,19.5604 H 38.795244 Z"
d="M 0,612 792,612 792,0 0,0 0,612 z"
d="m 418.47354,298.2576 0,-18.688 23.557,38.945 -23.557,-20.257 z"
d="m 418.47354,298.2526 0,-18.683 9.812,26.401 7.612,2.411 6.133,10.133 -23.557,-20.262 z"
d="m 321.02454,279.4346 0,1.161 5.232,0 0,38.372 -5.232,0 0,1.164 16.857,0 0,-1.164 -5.231,0 0,-38.372 5.231,0 0,-1.161 -16.857,0 z"
d="m 352.44754,292.3416 -26.191,0 0,1.162 26.191,0 0,-1.162 z"
d="m 407.46154,278.6196 c -0.112,0.874 -1.224,1.863 -2.849,1.863 -1.797,0 -4.88,-1.978 -9.766,-1.978 -10.585,0 -17.966,9.769 -17.966,21.28 0,11.512 7.381,21.279 17.966,21.279 3.776,0 6.223,-1.748 9.241,-1.748 1.049,0 2.097,0.874 2.209,1.626 l 1.165,0 0,-12.785 -1.165,0 c 0,7.905 -6.45,11.741 -11.45,11.741 -2.557,0 -4.884,-0.461 -6.858,-2.32 -2.562,-2.508 -4.365,-8.257 -4.365,-17.793 0,-9.539 1.803,-15.293 4.365,-17.791 1.974,-1.862 4.301,-2.328 6.858,-2.328 7.501,0 12.615,5.294 12.615,12.854 l 1.164,0 0,-13.9 -1.164,0 z"
d="m 363.01654,279.4346 0,1.161 5.349,0 -4.301,11.746 -13.608,0 -4.301,-11.746 5.349,0 0,-1.161 -11.511,0 0,1.161 4.94,0 14.71,40.582 0.816,0 15.916,-40.582 3.733,0 0,-1.161 -17.092,0 z m -5.7,31.862 -6.454,-17.793 12.853,0 -6.399,17.793 z"
d="m 363.71554,293.5036 0.349,-1.162 20.043,0 c 0,0 -0.139,0.689 -0.152,1.162 l -20.24,0 z"
d="m 15.72,9.431 c -0.069,1.514 -1.127,3.588 -3.172,6.22 -2.114,2.749 -3.903,4.124 -5.367,4.124 -0.906,0 -1.673,-0.837 -2.3,-2.512 C 4.463,15.728 4.044,14.194 3.626,12.659 3.161,10.985 2.662,10.147 2.128,10.147 c -0.116,0 -0.524,0.245 -1.221,0.733 L 0.176,9.937 C 0.943,9.263 1.7,8.588 2.445,7.912 3.469,7.028 4.237,6.562 4.75,6.515 5.96,6.399 6.705,7.227 6.985,8.998 c 0.302,1.912 0.511,3.101 0.628,3.566 0.349,1.586 0.733,2.378 1.152,2.378 0.326,0 0.815,-0.515 1.467,-1.543 0.651,-1.029 1,-1.812 1.047,-2.349 0.093,-0.888 -0.256,-1.333 -1.047,-1.333 -0.373,0 -0.757,0.085 -1.151,0.255 0.764,-2.504 2.224,-3.721 4.38,-3.652 1.598,0.047 2.351,1.084 2.259,3.111"
d="m 22.281,1.918 c -0.023,0.58 -0.314,1.136 -0.874,1.669 -0.628,0.602 -1.373,0.903 -2.234,0.903 -1.327,0 -1.968,-0.579 -1.921,-1.737 0.022,-0.602 0.378,-1.182 1.064,-1.738 0.687,-0.555 1.449,-0.834 2.288,-0.834 0.489,0 0.896,0.192 1.223,0.574 0.325,0.382 0.477,0.77 0.454,1.163 z m 3.038,12.419 c -0.652,1.232 -1.548,2.349 -2.689,3.349 -1.56,1.349 -3.119,2.024 -4.679,2.024 -0.723,0 -1.275,-0.233 -1.659,-0.699 -0.384,-0.465 -0.565,-1.069 -0.541,-1.814 0.022,-0.767 0.261,-1.954 0.715,-3.56 0.454,-1.605 0.682,-2.466 0.682,-2.582 0,-0.605 -0.21,-0.908 -0.629,-0.908 -0.139,0 -0.536,0.245 -1.188,0.733 L 14.528,9.937 c 0.745,-0.674 1.49,-1.349 2.235,-2.025 1.001,-0.884 1.746,-1.35 2.236,-1.397 0.768,-0.069 1.332,0.157 1.693,0.679 0.36,0.523 0.494,1.2 0.402,2.035 -0.303,1.415 -0.629,3.212 -0.978,5.392 -0.024,0.998 0.337,1.496 1.082,1.496 0.326,0 0.908,-0.344 1.746,-1.033 0.699,-0.574 1.269,-1.114 1.712,-1.62 l 0.663,0.873"
d="m 47.127,14.336 c -0.652,1.233 -1.548,2.349 -2.689,3.349 -1.56,1.349 -3.12,2.024 -4.679,2.024 -1.514,0 -2.247,-0.837 -2.2,-2.513 0.022,-0.745 0.168,-1.639 0.436,-2.686 0.267,-1.048 0.413,-1.862 0.436,-2.444 0.024,-0.883 -0.245,-1.326 -0.806,-1.326 -0.607,0 -1.331,0.722 -2.172,2.165 -0.887,1.514 -1.367,2.98 -1.436,4.4 -0.05,1.002 0.05,1.77 0.293,2.305 -1.624,0.047 -2.762,-0.221 -3.411,-0.803 -0.582,-0.512 -0.848,-1.361 -0.801,-2.549 0.02,-0.745 0.136,-1.49 0.343,-2.235 0.205,-0.745 0.319,-1.408 0.342,-1.991 0.05,-0.861 -0.268,-1.292 -0.944,-1.292 -0.583,0 -1.213,0.664 -1.888,1.991 -0.676,1.326 -1.049,2.712 -1.119,4.155 -0.05,1.305 0.04,2.212 0.25,2.724 -1.598,0.047 -2.733,-0.29 -3.404,-1.01 -0.558,-0.603 -0.812,-1.52 -0.765,-2.751 0.02,-0.603 0.129,-1.445 0.321,-2.524 0.192,-1.08 0.299,-1.921 0.321,-2.525 0.05,-0.417 -0.06,-0.627 -0.314,-0.627 -0.14,0 -0.536,0.236 -1.188,0.707 L 21.215,9.937 c 0.117,-0.092 0.849,-0.768 2.2,-2.025 0.978,-0.907 1.641,-1.373 1.99,-1.396 0.606,-0.047 1.094,0.203 1.467,0.75 0.372,0.547 0.559,1.182 0.559,1.903 0,0.233 -0.02,0.454 -0.07,0.664 0.349,-0.535 0.756,-1.002 1.222,-1.398 1.071,-0.93 2.27,-1.455 3.597,-1.571 1.141,-0.093 1.955,0.174 2.445,0.803 0.395,0.512 0.581,1.246 0.558,2.2 0.163,-0.139 0.338,-0.291 0.525,-0.454 0.534,-0.628 1.058,-1.128 1.57,-1.501 0.861,-0.629 1.759,-0.978 2.689,-1.048 1.118,-0.093 1.921,0.173 2.41,0.8 0.418,0.51 0.605,1.241 0.559,2.191 -0.024,0.65 -0.181,1.595 -0.472,2.836 -0.292,1.241 -0.436,1.953 -0.436,2.139 -0.024,0.488 0.023,0.824 0.139,1.009 0.117,0.186 0.395,0.278 0.838,0.278 0.326,0 0.907,-0.344 1.746,-1.034 0.698,-0.573 1.269,-1.113 1.712,-1.619 l 0.664,0.872"
d="m 52.295,10.654 c 0.022,-0.625 -0.233,-0.938 -0.767,-0.938 -0.698,0 -1.407,0.481 -2.127,1.442 -0.721,0.961 -1.093,1.882 -1.116,2.762 -0.013,0 -0.013,0.151 0,0.452 1.139,-0.417 2.127,-1.053 2.964,-1.911 0.674,-0.741 1.022,-1.344 1.046,-1.807 z m 7.927,3.646 c -0.675,1.117 -2.002,2.232 -3.981,3.348 -2.467,1.418 -4.971,2.126 -7.508,2.126 -1.885,0 -3.237,-0.628 -4.051,-1.885 -0.582,-0.861 -0.861,-1.885 -0.838,-3.072 0.023,-1.885 0.862,-3.677 2.515,-5.377 1.815,-1.862 3.957,-2.794 6.425,-2.794 2.282,0 3.492,0.93 3.632,2.787 0.093,1.184 -0.559,2.404 -1.956,3.658 -1.49,1.371 -3.365,2.241 -5.622,2.612 0.418,0.581 1.046,0.871 1.885,0.871 1.676,0 3.504,-0.426 5.483,-1.279 1.42,-0.599 2.538,-1.221 3.353,-1.866 l 0.663,0.871"
d="m 65.755,11.828 c 0.023,-0.63 -0.064,-1.207 -0.262,-1.732 -0.198,-0.524 -0.484,-0.788 -0.855,-0.788 -1.188,0 -2.166,0.642 -2.933,1.925 -0.653,1.05 -1.003,2.17 -1.048,3.358 -0.024,0.584 0.081,1.098 0.314,1.54 0.255,0.514 0.616,0.77 1.083,0.77 1.047,0 1.944,-0.617 2.689,-1.854 0.628,-1.027 0.965,-2.1 1.012,-3.219 z m 3.946,0.132 c -0.093,2.139 -0.884,3.987 -2.374,5.544 -1.49,1.557 -3.342,2.336 -5.553,2.336 -1.839,0 -3.236,-0.593 -4.19,-1.779 -0.698,-0.883 -1.083,-1.987 -1.152,-3.311 -0.118,-2 0.604,-3.836 2.165,-5.51 1.676,-1.859 3.782,-2.789 6.32,-2.789 1.629,0 2.863,0.547 3.702,1.639 0.792,1 1.152,2.29 1.082,3.87"
enable-background="new 0 0 329.149 43.537"
d="M1.3,38.015c-0.591-0.859,1.774-1.345,2.205-2.312c2.151-4.087-1.667-2.42-3.28-11.775 C-2.894,6.237,27.379,6.237,31.411,5.539C35.121,4.893,31.358,0,34.261,0c0.968,0,0,2.527,0.968,2.903 c1.021,0.431,1.613-2.312,2.635-1.451c1.398,1.183-1.344,2.258-0.591,3.011C37.81,5,39.101,3.979,39.531,4.678 c0.752,1.129-1.291,1.881-3.119,2.205c-6.667,1.129,7.635,30.273-15.593,34.304c-6.129,1.129-8.979-4.246-13.55-1.612 c-1.13,0.646-1.936,3.118-2.635,2.098c-0.43-0.646,0.699-1.668,0-2.098c-0.483-0.269-1.182,0.914-1.667,0.483 c-0.376-0.376,0.162-0.968-0.215-1.451C2.43,38.124,1.677,38.553,1.3,38.015z M10.334,13.711c3.656-2.688,10.7-4.893,9.194-4.838 C14.42,9.033,4.043,13.228,3.559,19.68C3.397,21.723,6.677,16.4,10.334,13.711z M16.786,21.777 C23.4,12.635,33.24,9.356,32.111,8.227c-1.344-1.344-7.259,0.484-7.259,0.484C15.657,11.937,5.656,17.959,5.01,25.488 c-0.214,2.203,0.43,6.345,3.226,8.064C10.172,34.736,13.506,26.293,16.786,21.777z M24.045,36.295 c8.603-3.065,8.496-14.25,7.098-11.131c-1.397,3.065-2.313,5.538-5.323,7.258c-2.366,1.345-4.033,1.506-6.937,1.453 c-2.42-0.054-4.624-2.043-5.323,0.967C12.807,38.176,20.873,37.424,24.045,36.295z M17.108,30.165 c2.474,0.43,10.377-1.397,13.066-10.808c2.743-9.679,1.344-7.742-6.613,0.483C19.259,24.303,15.872,29.95,17.108,30.165z"
d="M113.648,43.207c-7.924,0-12.499-5.282-12.499-13.254c0-7.121,5.99-11.744,13.537-11.744 c6.65,0,11.838,4.575,11.838,11.886v1.886h-17.216c0,2.736,3.208,4.01,5.565,4.01c2.783,0,4.293-0.708,5.189-1.463l4.245,4.622 C123.223,40.094,119.828,43.207,113.648,43.207z M114.733,24.529c-2.17,0-5,1.32-5.377,2.735h7.216c0.802,0,1.792,0,1.792-0.707 C118.365,24.906,116.762,24.529,114.733,24.529z"
d="M162.088,43.537c-10.66,0-18.725-8.254-18.725-19.81c0-10.848,9.15-18.584,18.725-18.584 c9.528,0,18.725,7.736,18.725,18.584C180.813,35.283,172.748,43.537,162.088,43.537z M162.088,30.896 c3.443,0,6.603-2.971,6.603-7.169c0-3.396-3.16-6.273-6.603-6.273c-3.491,0-6.65,2.876-6.65,6.273 C155.438,27.925,158.598,30.896,162.088,30.896z"
d="M259.297,43.537c-10.659,0-18.725-8.254-18.725-19.81c0-10.848,9.149-18.584,18.725-18.584 c9.528,0,18.726,7.736,18.726,18.584C278.022,35.283,269.957,43.537,259.297,43.537z M259.297,30.896 c3.443,0,6.604-2.971,6.604-7.169c0-3.396-3.16-6.273-6.604-6.273c-3.49,0-6.65,2.876-6.65,6.273 C252.646,27.925,255.807,30.896,259.297,30.896z"
d="M321.886,9.294c0-2.028,1.604-3.631,3.631-3.631c2.028,0,3.633,1.603,3.633,3.631c0,2.028-1.604,3.632-3.633,3.632 C323.489,12.926,321.886,11.322,321.886,9.294z M328.726,9.294c0-1.792-1.415-3.207-3.209-3.207c-1.744,0-3.207,1.415-3.207,3.207 s1.463,3.207,3.207,3.207C327.311,12.501,328.726,11.086,328.726,9.294z M327.357,11.322h-0.613l-1.18-1.886h-0.896v1.886h-0.52 V7.266h1.793c0.329,0,0.708,0,0.99,0.189c0.33,0.189,0.472,0.519,0.472,0.895c0,0.802-0.566,1.086-1.274,1.086L327.357,11.322z M325.424,9.058c0.565,0,1.461,0.095,1.461-0.753c0-0.614-0.565-0.708-1.037-0.708h-1.179v1.461H325.424z"
d="M 83.57,107.394 C 100.132,45.544 156.57,0 223.646,0 c 67.696,0 124.57,46.39 140.54,109.115 l -58.306,0.025 -6.72,-15.43 c 0,0 11.465,-10.703 14.414,-13.92 5.004,-5.458 1.812,-8.672 -0.96,-11.76 -2.772,-3.088 -8.005,-9.04 -11.488,-12.476 -3.483,-3.436 -7.562,-6.473 -12.812,-0.223 -1.31,1.566 -13.873,14.14 -13.873,14.14 l -32.804,-13.92 -0.068,-21.47 c 0,-6 -2.95,-6.68 -7.25,-6.75 -4.3,-0.07 -15.584,-0.01 -19.5,0 -3.916,0.01 -7.75,1 -7.75,7.25 0,6.56 0.177,21.21 0.177,21.21 l -33.36,13.44 -15.474,-14.64 c -4.78,-4.3 -7.973,-1.506 -10.435,1.037 -2.462,2.543 -9.794,10.34 -11.906,12.458 -2.112,2.118 -5.25,6.25 -1.064,11.23 4.88,4.878 14.64,14.64 14.64,14.64 l -6.55,13.61 -59.52,-0.166 z m 59.59,74.876 6.48,14.4 c -12.213,12 -12.836,13.033 -13.828,13.996 -5.667,5.5 -2.667,9.043 -0.75,10.917 2.405,2.352 11.718,11.532 13.75,13.5 2.667,2.583 6.5,4.75 10.667,0.417 3.354,-3.36 14.64,-14.59 14.64,-14.59 l 33.12,13.92 c 0,0 -0.078,13.753 0,20.503 0.078,6.75 3.57,7.656 6.57,7.578 3,-0.078 18.25,0.08 20.75,0 2.5,-0.08 6.5,-0.073 6.994,-7.573 l 0,-20.748 33.36,-13.438 38.563,37.687 c -24.707,19.51 -55.91,31.16 -89.83,31.16 -67.363,0 -123.997,-45.937 -140.287,-108.192 l 59.8,0.463 z"
d="m 0,117.178 49.362,0 c 13.674,0 20.317,3.708 20.317,14.678 0,9.578 -3.48,11.433 -8.27,12.823 l 0,0.23 c 7.492,0.924 10.273,4.94 10.273,13.36 0,12.287 -7.26,14.837 -17.07,14.837 l -54.612,0 0,-55.93 z m 17.15,22.17 30.358,0 c 3.167,0 5.02,-1.158 5.02,-4.326 0,-3.245 -1.853,-4.403 -5.02,-4.403 l -30.358,0 0,8.724 z m 0,20.317 30.745,0 c 3.708,0 6.18,-0.85 6.18,-4.095 0,-3.785 -2.472,-4.635 -6.18,-4.635 l -30.745,0 0,8.73 z m 64.89,-42.487 61.18,0 0,12.978 -44.032,0 0,8.96 41.715,0 0,11.588 -41.715,0 0,8.96 45.036,0 0,13.446 -62.184,0 0,-55.932 z m 67.67,0 65.352,0 0,13.905 -24.102,0 0,42.028 -17.15,0 0,-42.023 -24.1,0 0,-13.908 z m 72.073,0 17.157,0 0,19.93 36.152,0 0,-19.93 17.15,0 0,55.933 -17.15,0 0,-21.17 -36.152,0 0,21.17 -17.157,0 0,-55.93 z m 81.275,0 61.196,0 0,12.978 -44.034,0 0,8.96 41.716,0 0,11.588 -41.716,0 0,8.96 45.038,0 0,13.446 -62.2,0 0,-55.932 z m 70.775,37.62 17.148,0 c 0.08,5.948 2.477,6.412 7.42,6.412 l 21.013,0 c 3.63,0 7.338,-0.387 7.338,-4.713 0,-4.866 -2.007,-5.175 -24.1,-5.175 -25.8,0 -28.736,-3.09 -28.736,-16.84 0,-10.12 0.927,-17.922 22.557,-17.922 l 23.95,0 c 19.774,0 21.63,6.72 21.63,16.532 l 0,1.777 -17.153,0 c 0,-4.1 -0.465,-5.8 -8.345,-5.8 l -19,0 c -3.863,0 -6.49,1.314 -6.49,4.328 0,4.866 2.087,5.02 20.47,4.943 26.65,-0.076 32.83,1.546 32.83,17.846 0,15.066 -5.096,17.54 -27.885,17.54 l -20.78,0 c -15.605,0 -21.86,-2.938 -21.86,-15.07 l 0,-3.864 z m 81.73,-37.62 51.757,0 c 17.148,0 23.174,5.64 23.174,19.467 l 0,16.995 c 0,13.83 -6.025,19.47 -23.174,19.47 l -51.758,0 0,-55.93 z m 17.147,41.56 30.438,0 c 7.34,0 10.197,-2.086 10.197,-10.043 l 0,-7.57 c 0,-7.957 -2.858,-10.042 -10.197,-10.042 l -30.438,0 0,27.655 z m 92.932,-41.56 22.325,0 30.746,55.933 -19.083,0 -5.327,-9.89 -34.763,0 -5.02,9.895 -19.16,0 30.282,-55.932 z m 0.31,33.99 21.94,0 -11.124,-21.013 -10.815,21.013 z m -311.257,50.946 c 0,7.092 -2.304,9.612 -8.82,9.612 l -14.545,0 c -7.056,0 -9.288,-3.168 -9.288,-9.756 l 0,-7.128 c 0,-6.59 2.232,-9.757 9.29,-9.757 l 13.32,0 c 4.68,0 9.683,1.152 9.683,7.164 l 0,0.932 -3.312,0 c 0,-4.86 -1.477,-5.22 -10.188,-5.22 l -9.144,0 c -3.38,0 -6.12,1.008 -6.12,5.544 l 0,9.79 c 0,4.537 2.74,5.545 6.12,5.545 l 13.79,0 c 3.53,0 5.69,-1.224 5.69,-4.823 l 0,-2.628 -13.354,0 0,-2.88 16.883,0 0,3.6 z m 18.79,-16.74 4.394,0 15.474,26.064 -3.995,0 -3.24,-5.508 -20.88,0 -3.24,5.508 -3.996,0 15.48,-26.064 z m 2.197,2.88 -8.748,14.797 17.496,0 -8.748,-14.792 z m 21.816,-2.88 5.51,0 15.24,21.853 15.23,-21.853 5.508,0 0,26.064 -3.528,0 0,-22.896 -0.07,0 -15.878,22.896 -2.52,0 -15.89,-22.896 -0.073,0 0,22.896 -3.527,0 0,-26.064 z m 48.182,0 25.596,0 0,2.88 -22.066,0 0,8.316 21.203,0 0,2.88 -21.203,0 0,9.108 22.21,0 0,2.88 -25.74,0 0,-26.064 z m 48.528,17.856 3.312,0 0,1.836 c 0,2.556 1.368,3.78 5.76,3.78 l 10.944,0 c 5.112,0 6.624,-1.08 6.624,-4.824 0,-3.276 -1.296,-4.104 -5.688,-4.104 l -6.695,0 c -10.765,0 -14.293,-0.647 -14.293,-7.56 0,-5.94 3.528,-7.272 10.8,-7.272 l 7.597,0 c 8.743,0 10.94,2.232 10.94,6.876 l 0,0.9 -3.31,0 c -0.07,-4.14 -0.506,-4.896 -9.758,-4.896 l -3.741,0 c -6.804,0 -9.216,0.36 -9.216,4.645 0,3.1 0.972,4.14 6.48,4.14 l 10.44,0 c 6.875,0 9.755,1.98 9.755,6.41 l 0,1.69 c 0,6.41 -5.26,6.88 -10.48,6.88 l -9.79,0 c -5.15,0 -9.687,-0.9 -9.687,-6.59 l 0,-1.91 z m 46.872,-14.976 -13.176,0 0,-2.88 29.88,0 0,2.88 -13.176,0 0,23.185 -3.528,0 0,-23.19 z m 21.13,-2.88 3.53,0 0,19.477 c 0,2.52 0.863,4 5.65,4 l 12.24,0 c 4.788,0 5.652,-1.476 5.652,-3.995 l 0,-19.476 3.528,0 0,19.512 c 0,5.29 -2.664,6.84 -9.288,6.84 l -12.022,0 c -6.624,0 -9.288,-1.55 -9.288,-6.84 l 0,-19.512 z m 37.297,0 21.06,0 c 8.75,0 11.125,2.736 11.125,13.032 0,9.576 -2.376,13.032 -11.232,13.032 l -20.952,0 0,-26.064 z m 28.657,11.772 c 0,-7.524 -2.34,-8.893 -6.66,-8.893 l -18.468,0 0,20.305 17.892,0 c 4.284,0 7.236,-0.937 7.236,-8.748 l 0,-2.664 z m 9.863,-11.772 3.528,0 0,26.064 -3.528,0 0,-26.064 z m 10.583,9.47 c 0,-6.59 2.232,-9.758 9.29,-9.758 l 15.01,0 c 7.058,0 9.29,3.168 9.29,9.757 l 0,7.128 c 0,6.59 -2.232,9.76 -9.29,9.76 l -15.01,0 c -7.058,0 -9.29,-3.17 -9.29,-9.755 l 0,-7.127 z m 30.06,-1.333 c 0,-4.53 -2.735,-5.54 -6.12,-5.54 l -14.29,0 c -3.384,0 -6.12,1.01 -6.12,5.545 l 0,9.793 c 0,4.536 2.736,5.544 6.12,5.544 l 14.293,0 c 3.385,0 6.12,-1.01 6.12,-5.544 l 0,-9.792 z m 9.108,9.72 3.312,0 0,1.84 c 0,2.555 1.368,3.78 5.76,3.78 l 10.944,0 c 5.112,0 6.624,-1.08 6.624,-4.825 0,-3.276 -1.296,-4.104 -5.688,-4.104 l -6.696,0 c -10.765,0 -14.292,-0.647 -14.292,-7.56 0,-5.94 3.527,-7.272 10.8,-7.272 l 7.596,0 c 8.748,0 10.944,2.232 10.944,6.876 l 0,0.9 -3.312,0 c -0.07,-4.14 -0.504,-4.896 -9.756,-4.896 l -3.744,0 c -6.804,0 -9.216,0.36 -9.216,4.645 0,3.098 0.972,4.14 6.48,4.14 l 10.44,0 c 6.875,0 9.756,1.98 9.756,6.41 l 0,1.69 c 0,6.41 -5.257,6.878 -10.477,6.878 l -9.792,0 c -5.143,0 -9.68,-0.9 -9.68,-6.587 l 0,-1.91 z m 15.624,-80.722 c 0,-3.798 3.06,-6.858 6.858,-6.858 3.78,0 6.857,3.06 6.857,6.857 0,3.797 -3.077,6.858 -6.857,6.858 -3.798,0 -6.858,-3.06 -6.858,-6.858 z m 12.15,0 c 0,-2.934 -2.395,-5.292 -5.292,-5.292 -2.952,0 -5.292,2.358 -5.292,5.292 0,2.934 2.34,5.292 5.292,5.292 2.898,0 5.292,-2.36 5.292,-5.293 z m -1.872,3.763 -1.764,0 -1.656,-3.044 -1.386,0 0,3.042 -1.566,0 0,-7.418 3.708,0 c 1.71,0 2.88,0.304 2.88,2.266 0,1.368 -0.702,1.926 -2.016,2.016 l 1.8,3.133 z m -2.628,-4.233 c 0.828,0.018 1.278,-0.18 1.278,-1.116 0,-0.88 -0.937,-0.88 -1.656,-0.88 l -1.8,0 0,1.998 2.178,0 z"
d="M 0,3.9277203e-4 0,24.936088 l 24.44351,0 0,-24.93569522797 -24.44351,0 z M 15.829046,16.15344 l -7.2220021,0 0,-7.3666898 7.2220021,0 0,7.3666898 z m 35.83795,16.772606 11.039524,0 c 4.158834,0 6.158488,1.83518 6.158488,5.202562 0,4.397507 -3.193016,5.438762 -6.875742,5.438762 l -10.32227,0 0,-10.641324 z M 34.081915,57.1618 l 32.384003,0 c 10.081124,0 19.994064,-5.923526 19.994064,-17.356302 0,-8.396814 -4.798179,-12.472794 -9.91294,-14.237485 4.24169,-2.312525 7.029086,-5.437525 7.029086,-11.191631 0.0012,-5.8431439 -3.189306,-14.31415723 -18.2269,-14.31415723 l -31.267313,0 0,57.09957523 z m 17.585081,-43.508855 9.281015,0 c 3.598635,0 5.995252,1.038782 5.995252,3.920163 0,3.679016 -2.318708,4.720271 -5.995252,4.720271 l -9.281015,0 0,-8.640434 z m 51.650924,18.074793 c 0.72467,-4.476652 3.43787,-6.956124 8.16432,-6.956124 4.07227,0 6.94994,3.116343 6.94994,6.962307 l -15.11303,0 z m 30.31262,8.23605 c 0,-16.150573 -7.1206,-25.351207 -23.5927,-25.351207 -13.124504,0 -21.917045,9.839979 -21.917045,21.917046 0,13.83063 9.999506,21.669717 23.278595,21.669717 9.42941,0 18.15393,-4.158834 21.34695,-13.120795 l -14.79027,0 c -1.28116,2.00089 -4.08339,2.95929 -6.6482,2.95929 -4.94657,0 -7.66719,-3.363673 -8.0691,-8.07776 l 30.3893,-0.0025 z m 19.84814,-36.9484565 -15.84018,0 0,12.6409775 -7.0365,0 0,9.753413 7.0365,0 0,19.839484 c 0,11.352394 7.43966,12.391175 14.15958,12.391175 3.35625,0 6.95983,-0.477344 10.1578,-0.477344 l 0,-12.004106 c -1.20326,0.16942 -2.39909,0.244856 -3.60358,0.244856 -3.99437,0 -4.87857,-1.679363 -4.87857,-5.515434 l 0,-14.481104 8.47967,0 0,-9.75094 -8.48338,0 0,-12.6409775 z m 11.10507,54.1464685 15.83275,0 0,-21.913336 c 0,-6.64078 3.59864,-8.004798 6.32296,-8.004798 4.63247,0 5.19391,3.363672 5.19391,8.159379 l 0,21.758755 15.84141,0 0,-28.477444 c 0,-9.515977 -6.80772,-14.073011 -14.24861,-14.073011 -6.71003,0 -10.23571,2.324891 -12.95632,5.517906 l -0.15706,0 0,-20.06702623 -15.82904,0 0,57.09957523 z m 60.4348,-25.434062 c 0.71725,-4.476652 3.44282,-6.956124 8.16432,-6.956124 4.08093,0 6.94995,3.116343 6.94995,6.962307 l -15.11303,0 z m 30.31262,8.23605 c 0,-16.150573 -7.1107,-25.351207 -23.5927,-25.351207 -13.12079,0 -21.91828,9.839979 -21.91828,21.917046 0,13.83063 10.00074,21.669717 23.28601,21.669717 9.42323,0 18.15394,-4.921844 21.34077,-13.880094 l -14.78532,0 c -1.27374,1.999653 -4.08092,3.716115 -6.64572,3.716115 -4.95153,0 -7.67585,-3.363672 -8.07034,-8.075286 l 30.38929,0 z M 295.1709,27.72843 c -0.39078,-10.632667 -11.19163,-13.113375 -20.14988,-13.113375 -8.3189,0 -19.59833,2.720617 -19.59833,13.197467 0,7.115651 4.87608,10.956668 16.95439,13.03423 7.35803,1.278691 8.71834,1.998418 8.71834,4.402454 0,2.39909 -3.27711,3.199199 -5.3522,3.199199 -1.92298,0 -3.43787,-0.488475 -4.24169,-1.203255 -1.20325,-1.033835 -1.83518,-1.471607 -1.91309,-2.918481 l -15.11179,0 c 0.23249,10.721706 10.95667,13.881332 20.7039,13.881332 10.07865,0 21.12436,-3.125 21.12436,-14.641868 0,-6.801543 -4.64237,-9.917887 -9.9216,-11.599723 -5.28047,-1.756035 -11.26954,-2.077562 -13.91225,-3.202908 -0.8743,-0.395727 -1.83518,-0.952216 -1.83518,-2.157945 0,-2.714434 2.55491,-3.193015 4.79818,-3.193015 1.27869,0 2.56357,0.399436 3.51207,1.199545 1.04868,0.717254 1.76222,1.756035 1.84878,3.116343 l 14.38218,-0.0049 z m 46.6994,-27.66620523 -15.82905,0 0,20.14988123 -0.16323,0 c -2.39662,-3.521962 -6.64078,-5.597051 -11.35734,-5.597051 -13.9172,0 -17.67536,11.839632 -17.67536,21.591808 0,10.400178 5.6762,21.999901 17.43668,21.999901 7.75995,0 10.15285,-2.962999 12.15622,-5.608181 l 0.16447,0 0,4.563217 15.27256,0 0,-57.09586523 z M 326.60145,36.3701 c 0,4.951524 -1.27992,10.313613 -6.94994,10.313613 -5.68238,0 -6.96725,-5.362089 -6.96725,-10.313613 0,-4.878561 1.27993,-10.239414 6.96231,-10.239414 5.6663,0 6.94994,5.360853 6.94994,10.239414 m 45.16225,5.995252 c -0.24239,4.318361 -3.03473,6.472596 -6.64078,6.472596 -2.86902,0 -4.95895,-1.913089 -4.95895,-3.826178 0,-2.807182 1.83889,-3.690146 5.35715,-4.482835 2.16907,-0.489711 4.32207,-1.043728 6.24134,-2.003364 l 0,3.839781 z m 15.20083,-11.516868 c 0,-7.994905 0.14839,-16.237139 -19.68491,-16.237139 -9.83503,0 -20.86837,1.919271 -21.34819,13.59443 l 14.70741,0 c 0.0866,-1.753561 1.05486,-4.23798 5.92353,-4.23798 2.56851,0 5.20133,1.044965 5.20133,3.845964 0,2.641472 -2.16413,3.277107 -4.31589,3.680253 -8.08271,1.518599 -23.42823,1.033835 -23.42823,14.159577 0,8.713395 6.62594,12.551939 14.63198,12.551939 5.12589,0 9.99456,-1.125347 13.35575,-4.961417 l 0.16077,0 c -0.0816,1.121636 0.15458,2.804709 0.5602,3.920162 l 16.15552,0 c -1.76346,-2.638999 -1.91309,-6.158488 -1.91309,-9.281015 l 0,-17.028591 z m 4.62257,-8.740602 -1.20325,0 0,-4.897111 -1.83889,0 0,-1.038781 4.82662,0 0,1.038781 -1.78077,0 0,4.897111 z m 3.62337,0 -1.12906,0 0,-5.935892 1.88341,0 1.07341,4.097002 1.07959,-4.095766 1.88712,0 0,5.935893 -1.14513,0 0,-4.733874 -1.29106,4.732637 -1.07959,0 -1.27374,-4.731401 0.002,4.736348 z"